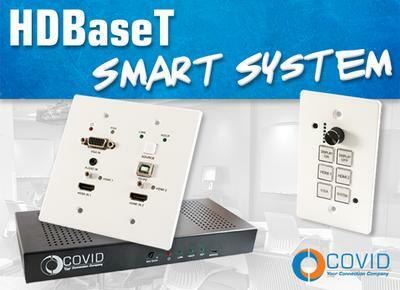 News | Introducing the Covid HDBaseT Smart System | Covid, Inc. | SMARTSolution Technologies L.P.
Covid, Inc. just launched its new HDBaseT Smart System, an all-in-one A/V control product bundle. This new device package is just one of many new products recently released by Covid that aim to help customers with signal management, and overall distribution of multiple signal types. • HDMI 1.4b, HDCP 2.2 and HDCP 1.4 compliant. • Video resolutions up to 4K2K@30Hz, 1080p@120Hz, and 1080p 3D@60Hz. (LPCM, Dolby TrueHD, and DTS-HD Master Audio). • HDBaseT™ over a single cat 6/6a cable up to 230ft/70m distance. • Support multi-VESA Standard VGA formats input. • Supports balanced MIC input. • 2x30watts@4 ohms amplifier output. • Supports interactive display USB pass-through. • Supports Web GUI control.